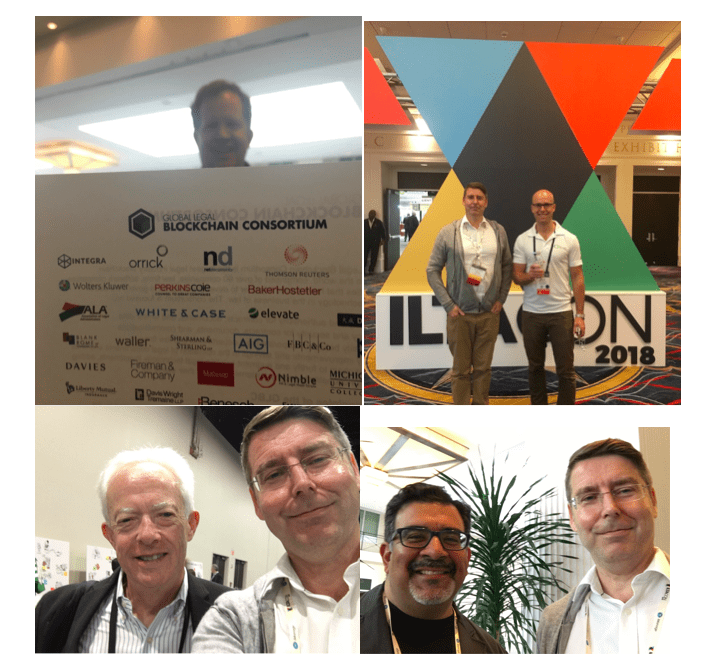 Last weekend Artificial Lawyer arrived in the US for ILTACon, the biggest legal tech event on the planet, and enjoyed four days of discussions, meetings and even the chance to chair some sessions, on a range of subjects and with a big cross-section of the tech community. First, I’d like to say a big thank you to the ILTACon organising team for inviting me to the event and for asking me to moderate the first three sessions on AI. It was an honour and very enjoyable – also, wow, what an epic event! I’d especially like to thank Rodney Mullins, Senior Manager, Software Planning and Development at US law firm, McGuire Woods, who did a tremendous job organising the AI sessions and making sure everything was in place and went to plan. Also, I’d like to say thank you to the many legal tech companies that spared the time to have a chat at what must be one of the busiest events of the year for you. It was great to meet so many of the top team at pioneering companies helping to reshape the legal market. And now, on Friday morning, still a bit jet-lagged and sifting through a mass of recollections, rapidly typed notes, and a medley of iPhone photos (see pics below), what were the key observations, at least as they related to AI and automation? 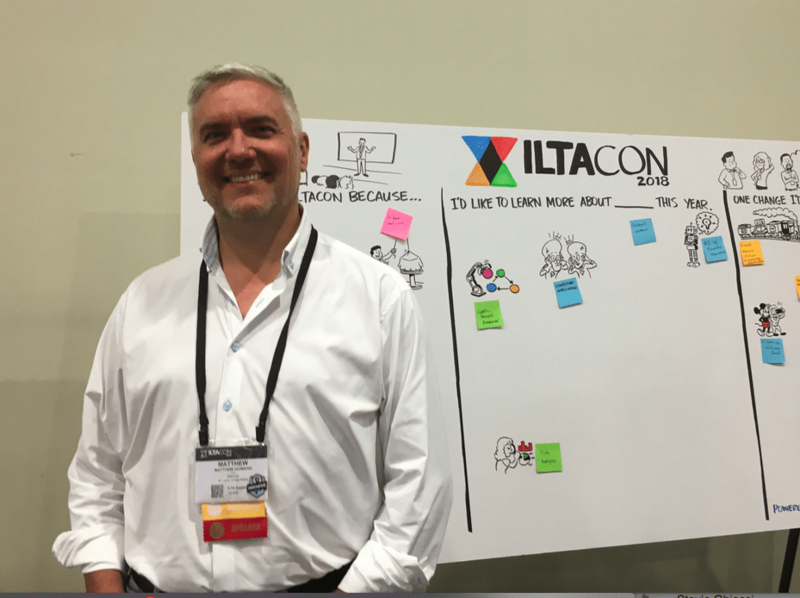 What key themes emerged at ILTACon? Here are a few thoughts that tap into the conference experience as a whole, rather than any particular session. Two years ago this site wrote a piece about a survey that had been aired at ILTACon 2016 (story here). It found that only 2% of respondents were using an ‘AI’ system in some way, although this covered a broad range of tech, including basic document automation. I.e. in 2016 the numbers using tech such as NLP-driven doc review systems for M&A work were tiny. Clipping from the 2016 ILTACon article. 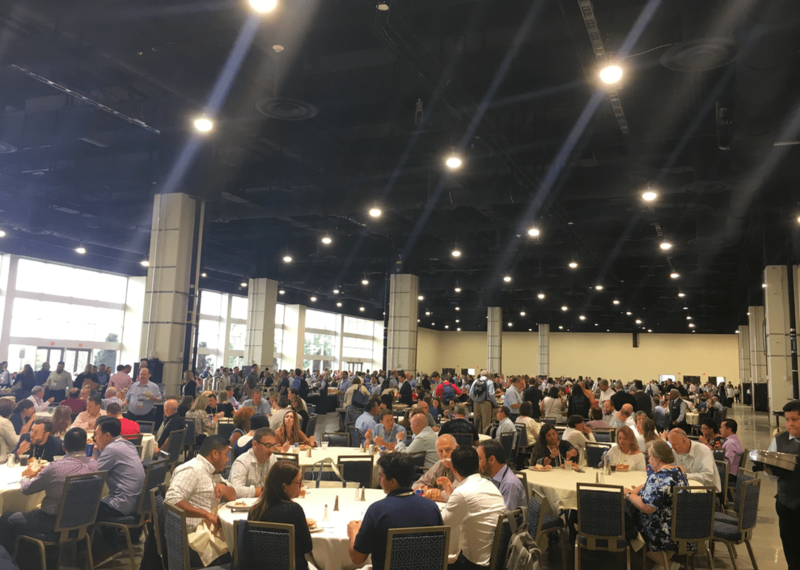 This time the most remarkable thing at ILTACon was how accepted it has all become, which in turn also signalled a far more mature understanding of the tech involved and the questions that needed to be grappled with. In short, the debate has moved on now to substantive issues around data quality needs for NLP training and real opportunities grounded in discussions around improvements to profit margins. What was even better were the questions from the audience and the points made by the many legal AI panelists from firms such as Kira Systems, iManage, Seal Software, Diligen, Intelllex, LexPredict, Ayfie and more. It was all so grounded in reality, in real ‘get your hands dirty’ matters around implementation, changes to client relationships, engagement at a firm-wide level, and even regulatory issues. I don’t think I heard the phrase ‘the end of lawyers’ one single time. There was one rendition of the good old red herring about how AI would interfere with lawyer training, but it was literally just heard once. If we are going to sell outward-facing automation of work (via an AI system), how do we sell this to the partnership? Is there a way of showing how much more profitable it is to automate part of the process? How much training should we expect to do to reach the desired level of accuracy with NLP? What’s the best way to do a pilot for an AI system and how much data is needed to set up a good test of doc review capabilities? I.e. these were very practical, substantive questions. There was no hype, there was no ‘magical thinking’. This was more like a seasoned car buyer going to a showroom and grilling the sales person about miles per gallon and what the warranty really offered to buyers. In short, legal AI has really come of age. And that is a very good thing. One of the other themes that emerged was around platformisation, i.e the idea that point solutions will need to be part of a wider, integrated eco-system of technologies to succeed in the future. Few people actually spoke explicitly about this, but Artificial Lawyer could not help but notice this was often a subtext issue for many of the tech companies at ILTACon, perhaps without them always being aware of it. There seem to be several things going on here. For example, ediscovery platform Relativity is building something of an ‘app store’ strategy, which allows legal AI applications that handle other areas, such as transactional doc review, to be used by clients all in the same place. The model is similar to owning an iPhone, which all your data passes through, but having the ability to download an app to do certain specialised tasks, as and when needed. Then you have the drive to create more and better integrations. And this is coming from the data collaboration and doc management companies as much as from the AI solutions companies. For example, HighQ has built its AIHub to make it easier to work with the many data extraction technologies rapidly growing across the market (see story). Other companies are also working on similar ideas. Then we have the model of iManage, following its merger with RAVN. Its well-publicised strategy is to bring the AI tech to the clients via their very successful suite of document management software. In effect, this is again a platform approach. 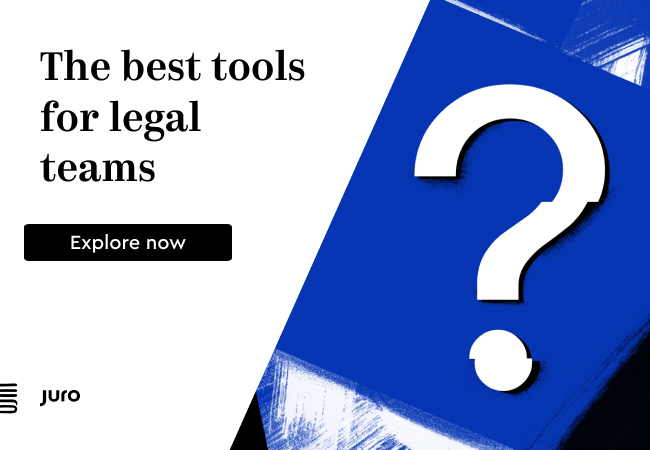 And, we cannot forget the growth of new AI solutions provided by the legal tech giants such as Thomson Reuters, which has just launched Westlaw Edge, along with a raft of other automation and AI solutions, from the continually evolving Contract Express (which out of interest is exploring integrations with blockchain tech), to the use of eBrevia in its LPO division. LexisNexis is also building out its own platform of AI and legal data solutions, so is Wolters Kluwer. In short, although we are not seeing a rush of mergers in legal AI land, the companies that are in, or connect to, this space are working hard at becoming more interconnected. Will this produce a handful of winners? Perhaps, perhaps not. The reality is that there is no single winning strategy here, no more than there is for law firms. However, certain strategies may end up defining a company’s market position in the years ahead, also just as has happened with law firms. 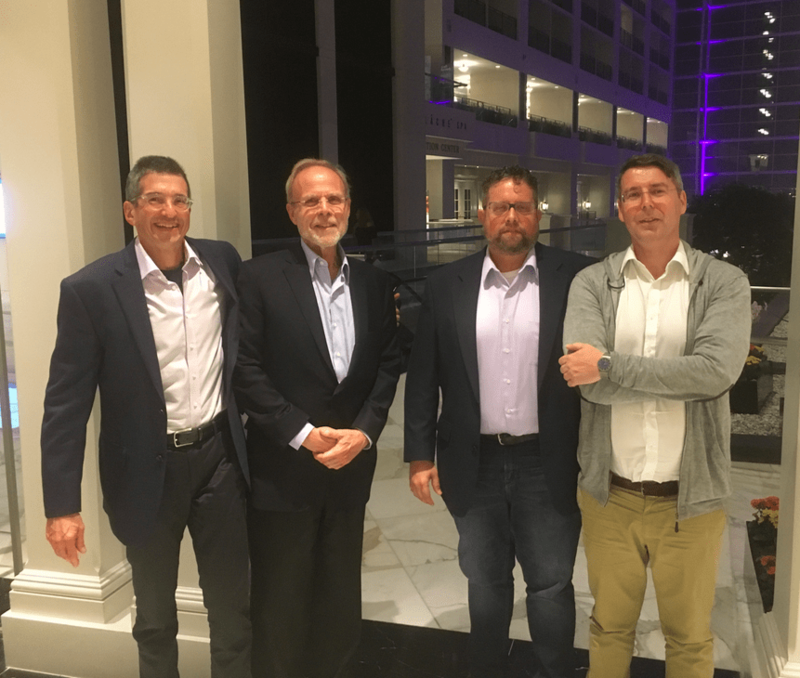 On Sunday, the Global Legal Blockchain Consortium held its annual meeting, which dovetailed into ILTACon. As this previous story shows, the goals and achievement of those tech companies tapping blockchain tech are getting more practical and substantive. The approach was focused on relatively modest, but real world solutions that seek to exploit the aspects of blockchain that work well, e.g. things like providing immutable IDs that can be stored without a central repository. Such seemingly innocuous innovations are very useful in many legal applications. One simple, but useful example was shown by a company that provides process server support for litigants and that want to prove legal papers have been served on a defendant in a way that cannot be tampered with, and so that judges can be 100% and independently certain papers really were delivered and that a case can then proceed (see same story noted above). The use of blockchain-based IDs to prove the authenticity of legal documents, or to verify which is their last version, were also shown. Again, modest, useful and very real applications of blockchain tech. And, Artificial Lawyer would venture, this is the pathway for blockchain to gain wider adoption in the legal world, rather than pitching toward the ‘Earth-shattering’ approach. 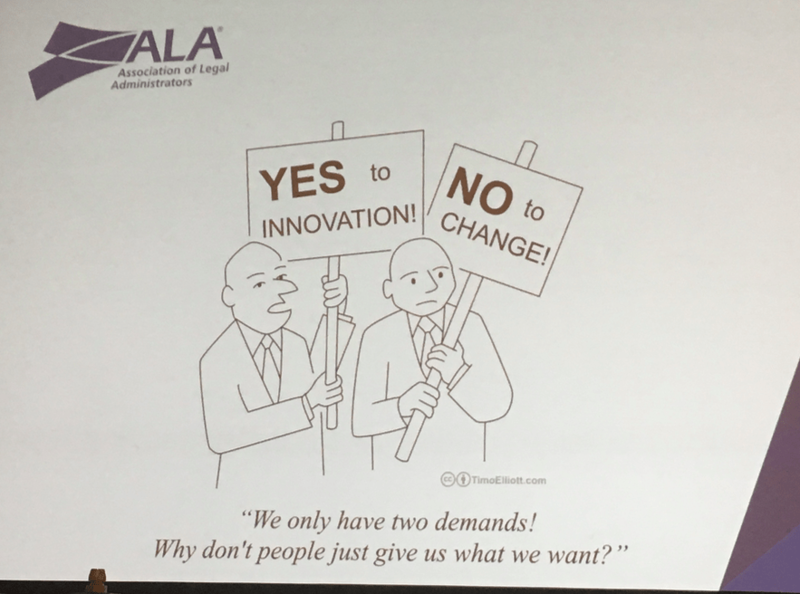 Most lawyers don’t want a worldwide revolution in how they work (even if some of us do…), they just want useful stuff that helps them in their work. And, it looks like blockchain can indeed provide this when its use cases stay very focused on day to day issues. During the second legal AI session we discussed the ethics of the tech and it was clear that both our eminent panel (Daniel Katz, Jose Lazares, Zi Qian Chang, Johannes Stiehler), and the audience, are all still finding our way through this. The situation was perhaps best encapsulated by a question from the audience along the lines of: ‘Hasn’t all technology created the same ethical issues and how is AI any different from what came before?’ The panel, and I, had a go at this and the consensus was that AI was different in that it was making decisions that would change over time, often based on how it interpreted the data given to it. In this respect AI was not in a ‘fixed state’ and so was not like tech we’ve had before. Also, as several of the panel pointed out, mistakes by an AI system can get amplified at scale. By way of analogy: if a single human is a bad driver they can be stopped. If an automated vehicle has a ‘bad’ algorithm then it affects thousands of vehicles on the roads all at the same time. This unusual combination of both scale and changeable decision-making appeared to set it apart from what has come before. But….hey…we’re not AI ethics experts. As noted during the session, we are all just pioneering together on this one. Much more will be revealed in the future and the real answers may not come until the courts one day inevitably have a chance to figure this one out. One other point from this was that insurance companies certainly need to get their heads around this subject, probably a lot faster than they are already. Putting aside AI and automation for a moment, one thing was clear from ILTACon: legal tech as an industry and as an area of importance for law firm management is booming. The massive convention centre at National Harbor at times was barely able to cope with the numbers of delegates. Some sessions had queues outside and staff were turning people away on occasion. The vendors hall was packed to the rafters. The meal hall looked like a scene from a World War Two movie about the embarkation of troops before D-Day. 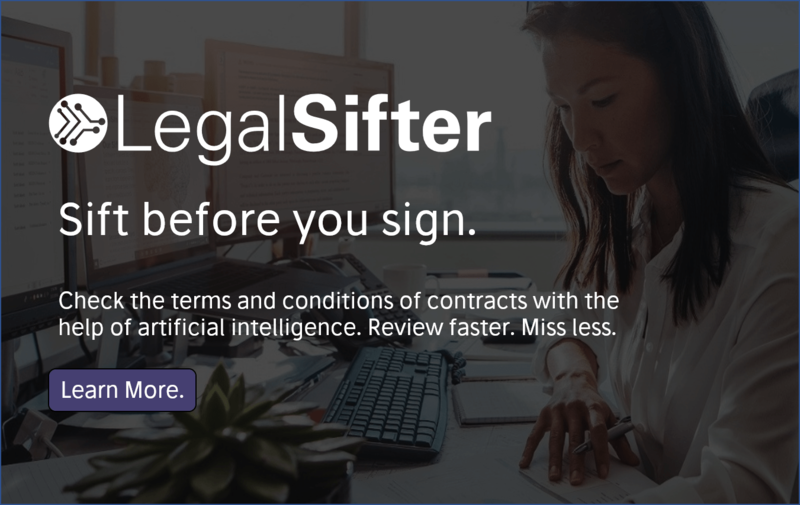 While this is great for all the tech companies, the bigger point here is that it reflects – Artificial Lawyer would argue – a change in the legal market, i.e. that the use of technology has clearly become more than a day to day operational issue and is now steadily moving toward a more strategic level of importance. A few years ago the idea of law firms hiring data analysts to pore over their information and help improve the output (and input…) of legal AI review systems would have seemed like science fiction. 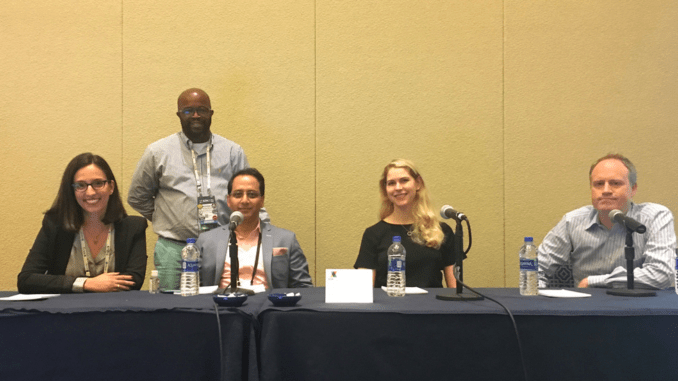 But, one panel at ILTACon saw three excellent data scientists from three different US law firms. I’ll go into this one later in more detail, but it’s worth pointing out that at least one of the firms had a team of nine data scientists working inside it. Moreover, four lawyers were also assigned to the data analysis group to work with the scientists. How incredible is that? And on that signal of how things have changed we’ll leave things for today. Just wanted to say thanks again to everyone I met at ILTACon, it was an excellent time. Below are a few photos taken during the week. 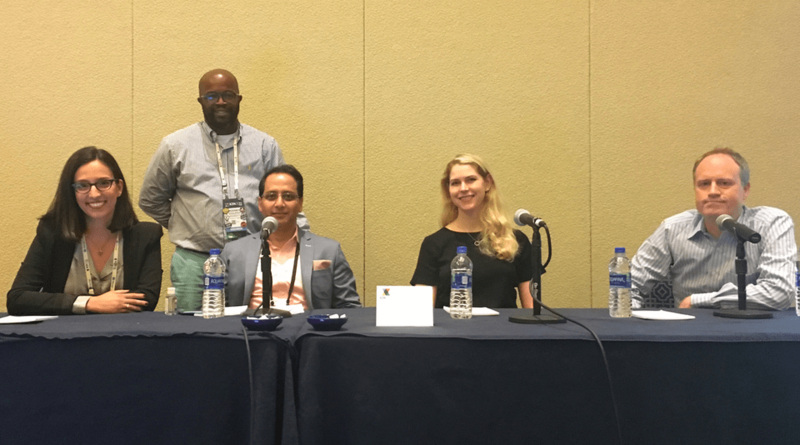 At the 3rd Legal AI Panel: (L to R) Sondra Rebenchuk (Kira Systems), Rodney Mullins (organiser), Arup Das (Alphaserve), Laura van Wyngaarden (Diligen), and Peter Wallqvist (iManage). 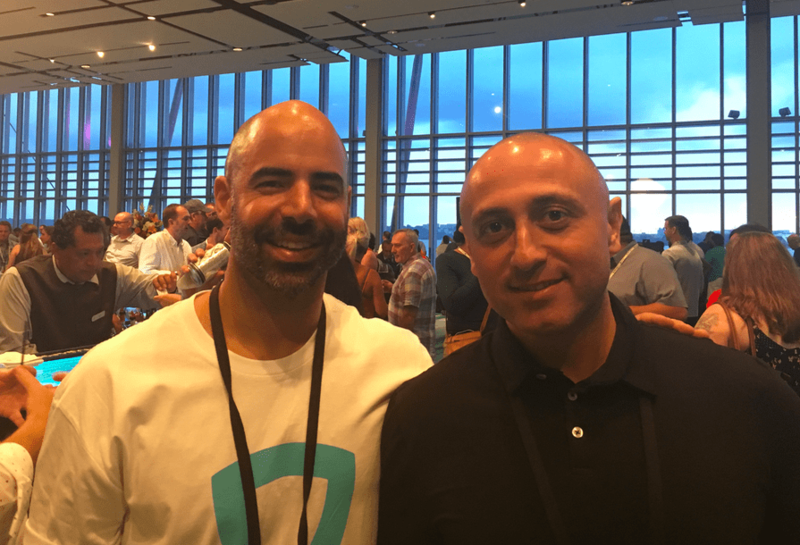 Two legal tech pioneers: Stevie Ghiassi (Legaler) and Julian Tsisin (Seal Software). (Top L to bottom R) David Fisher (Integra Ledger + GLBC), Noah Waisberg (Kira Systems), Bob Ambrogi, and Tom Martin (LawDroid). And that’s all folks…! Looking forward to the next ILTA event already.